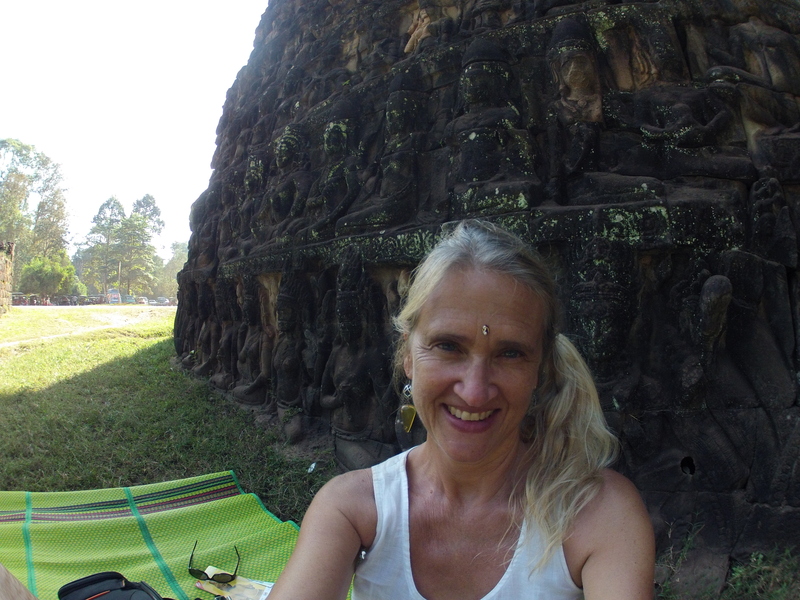 Christmas Eve I biked over to Ta Prohm before the hordes of people arrived in Angkor Wat. No problem at 5:30AM – the place was filled with birds cawing and the sun rising in tree boughs over my head. 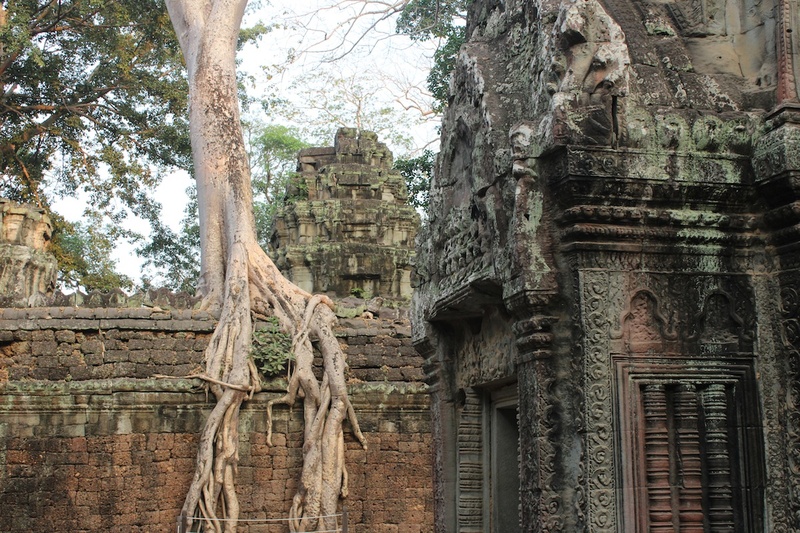 I’ve been in Cambodia for 7 weeks now and traveled all over this captivating country. You can’t rent a motorbike in Siem Reap – so the only option is a bike. Tuktuk drivers will ask 9,000 times a day if you need a ride. With a bike under me they don’t ask anymore. Yay. You can rent motorbikes outside of Siem Reap in other towns of Cambodia for about $5 a day. There are no buses in the towns. Taxis cost almost the same as USA – my rule of thumb is if it costs the same price as the USA I don’t need it. I’m in Asia to pay Asian prices – not to pay USA prices. And that goes double for buying Skippy peanut butter. It costs $5 for a tiny jar of it. Please! I’d finish that in one sitting. Guesthouses sell standard to luxury long distance bus tickets and you’ll get the same price as going to the station to buy it. Usually you can get some honest advice too. Language can be a problem so ask the ex-pats who have guesthouses to tell you how to get somewhere. They know; they live here. Angkor Wat. I was surprised by the hordes of tourists but hey I’m a tourist too. And I picked probably the most crowded week of the year to get my 3-day pass. On the days I visited; all of humanity was there. 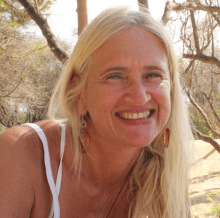 I had one of the best times in my life – how? Get up early! Yes, at 4AM. I rode my bike in the dark with a headlamp you might want to employ a tuktuk driver. They show up where you are staying and take you over to the temples. 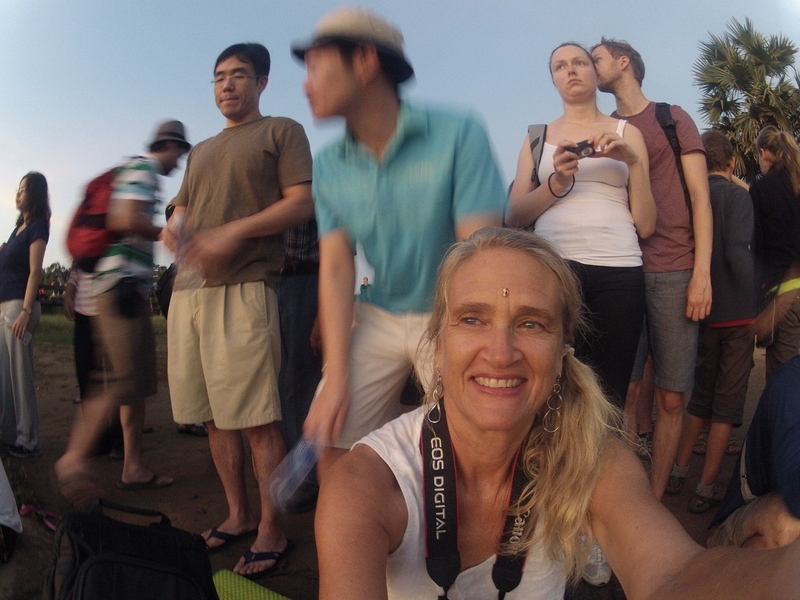 I hired one once for the sunset at Angkor Wat but the other days I biked. More fun and slower. So there I was riding the black velvet road on my way to Ta Prohm temple the one with the trees growing out of it. I was the only one there! It was dark and not lit up so I was glad to have my flashlight. Two other girls appeared; I called out to them, hey guys where’s the main temple here? Two North Americans, who also were enthusiastic to get up early, joined me and we shot photos, chatted, and had a blast. Then we wandered off doing our own photo shoots before the hordes arrived. It was mystical to see the golden light dawn in the towering treetops over my head. I felt happy and full of shine. It wasn’t that way at the sunrise at Angkor Wat with 12,000 people. Ok I exaggerate maybe it was just two thousand people but again I got there early. And bring a yoga matt to sit on so you’ll have more breathing space. 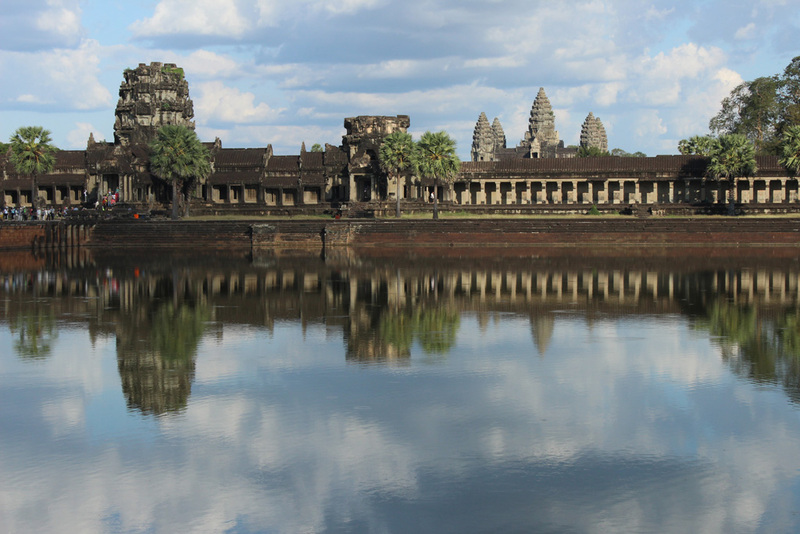 The sun rises over Angkor Wat and the reflection in the lotus pond is divine and otherworldly. One of the most exquisite things I’ve ever seen in my life. Don’t miss it. 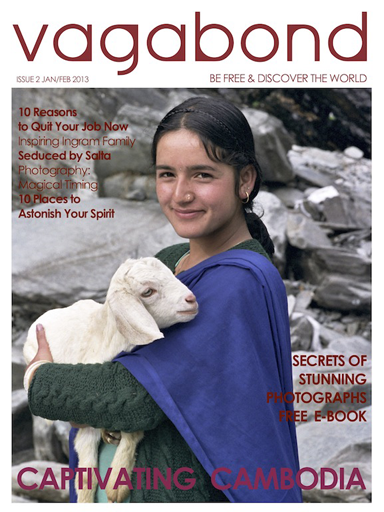 Captivating Cambodia, Issue 2 of Vagabond Magazine is in the iTunes store now for your iPad, check it out…be inspired to get that plane ticket and go discover the world. Intricate carvings of women adorning the ancient walls left me breathless. And I could get right next to them and see all the detail. 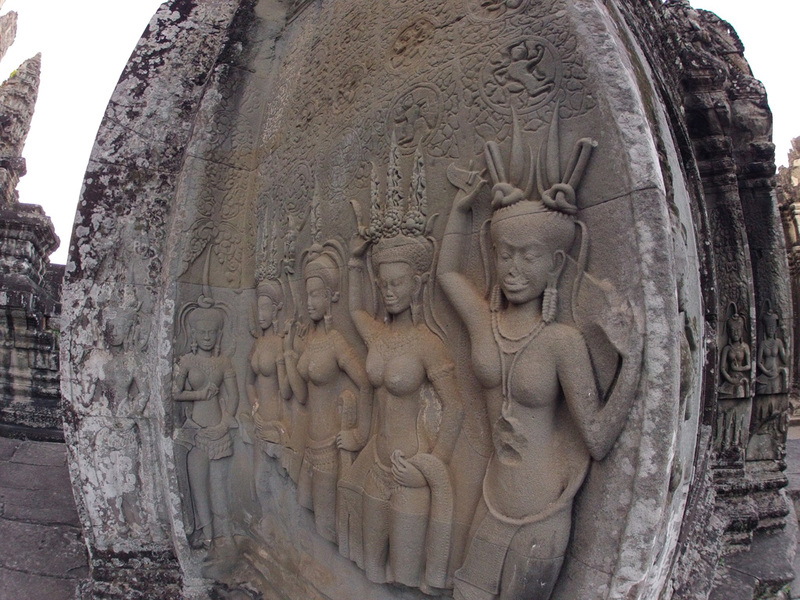 Top level of Angkor Wat. Sunset is also a wonderful time to see the temples. You can cuddle up with your pillow and wait for the end of the day. The yoga mat is also good for having picnics far from the madding crowds. 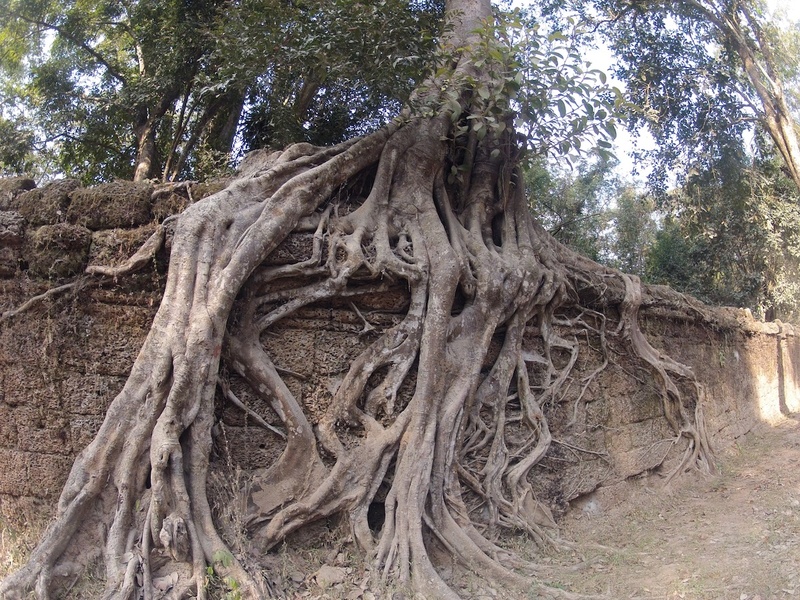 You can find shady areas to sit and munch and look carefully at a temple view or lotus pond. This pond was radiating the love energy – I almost died and went to a new realm just seeing it. Early morning is best as the blossoms open invitingly to the sky. Don’t miss the lotus pond- this is the biggest one I’ve ever seen in my life. Bigger than the Paul Gauguin garden in Tahiti. You will eat healthy here. You’ll find farmers markets filled with fresh fruit to make your innards happy. 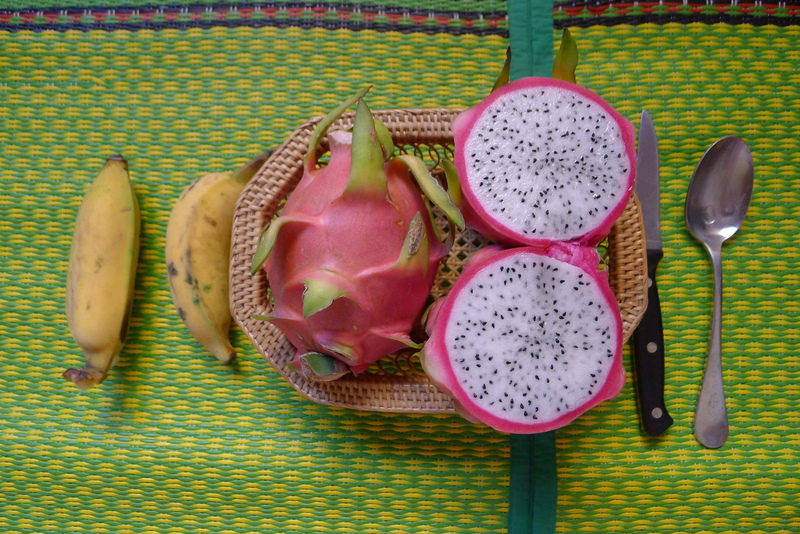 Here’s my breakfast, dragon fruit and bananas. Cambodia has wifi in most coffee shops and restaurants now – yahoo – that makes me happy. We’ll see what happens in Burma if I can still stay connected. The roads are not always smooth, for example the road between Sihanoukville and Kep/Kampot. You could rent a motorbike but you’d still have the craters, crevices, and dust clouds. I needed a massage after that spine-crushing ride over potholed roads. 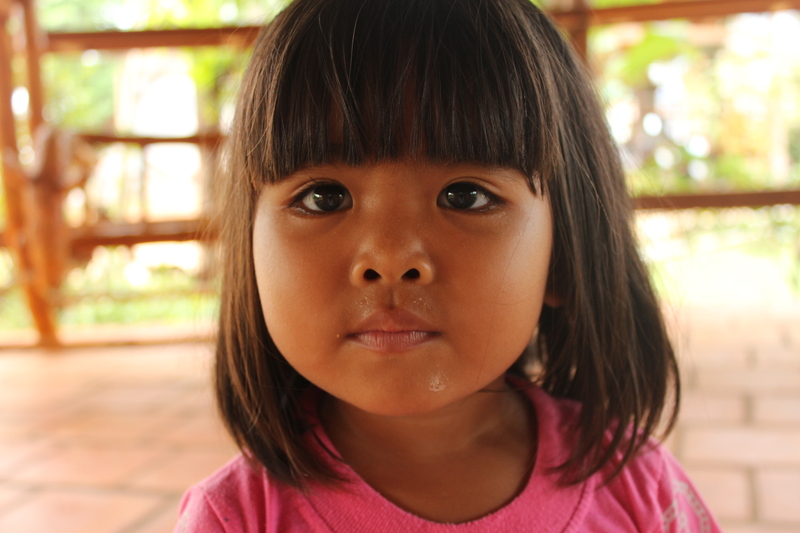 I’ll be going back to Thailand soon overland so we’ll see how that goes crossing the border from Cambodia. It should be easier than doing it the other way as every one wants to see Angkor Wat and I’ve all ready seen it and am leaving. 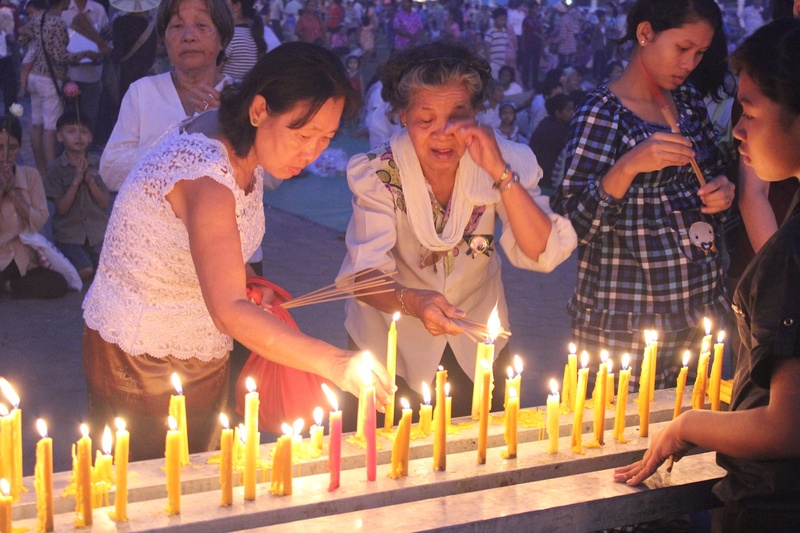 Perhaps there is less tout activity on the Thai side too. Kampot, Kep, and Otres Beach don’t have strong Internet connection – probably OK in Sihanoukville if you can stomach the litter and touts. 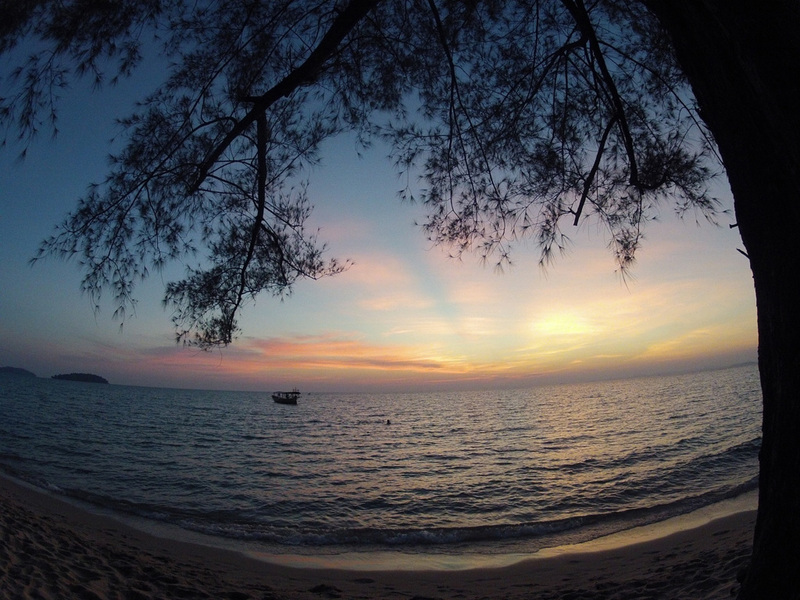 Go to Otres beach instead – it is about 6 kilometers south of the big Sihanoukville area. Quieter and prettier too. Or one of the islands, which I did not get to. 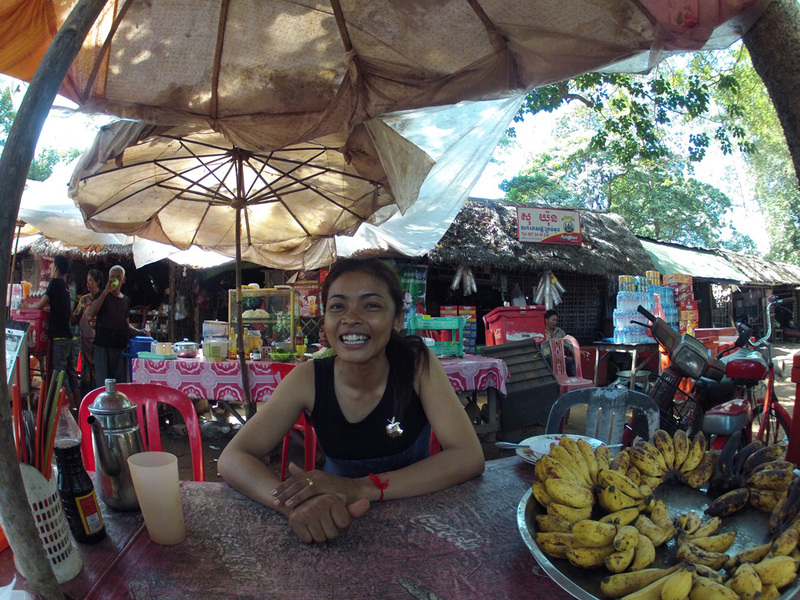 I loved Kampot – fresh seafood comes in from Kep and it has a small town feel that is friendly and non-touristy. 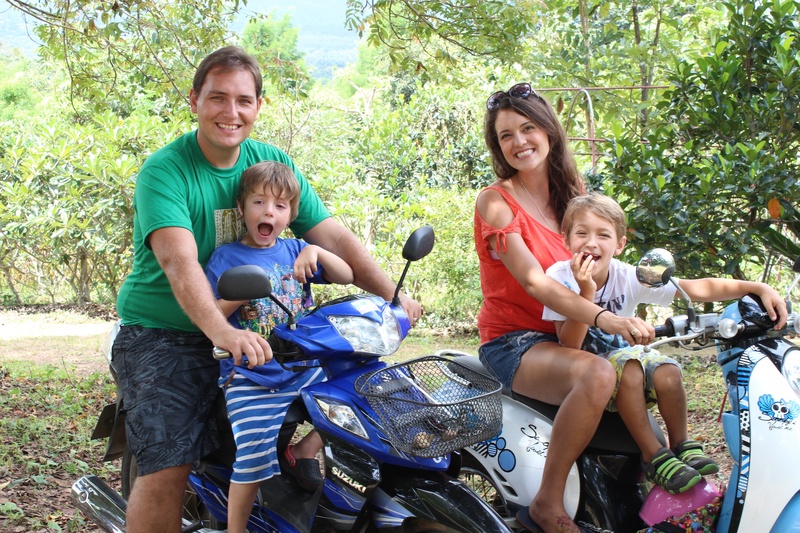 Kep – fun for an outing but maybe don’t ride your motorbike there like I did. Traffic on the dusty skinny road to get from Kampot to Kep is scary. Tourist vans and drivers who have just discovered motor vehicles are not all that interested in staying on their side of the road or giving much leeway to bikers. Glad I arrived with all my skin intact. Yes I wore my helmet – always do. 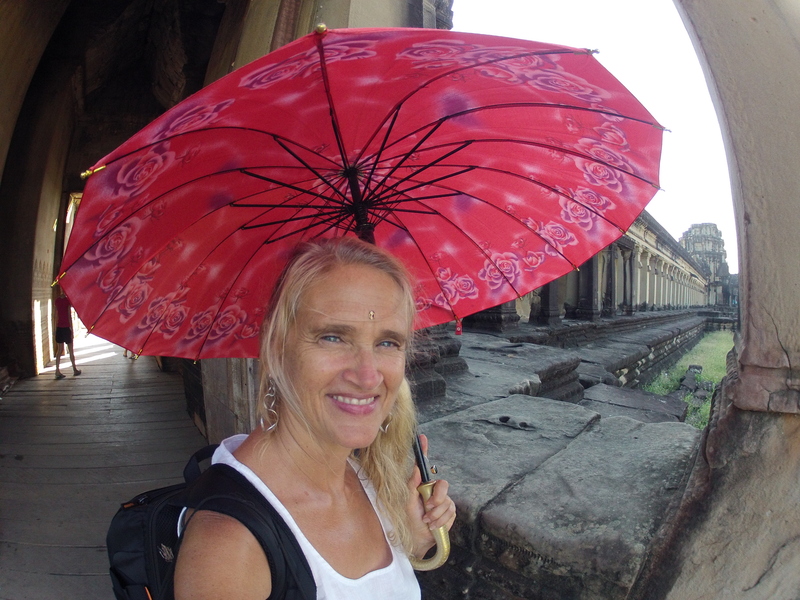 Phnom Penh – I didn’t hear anything about it until I stayed there 10 days. Many great restaurants, cheap high quality places to stay, and good markets if that’s your thing – check out the veggie and fish market – real stinky but fascinating for 5 minutes if you can stand the stench. $18 per room AC + wifi in double room. Good bed, super clean. He had just died so we couldn’t go inside it. And tuktuk drivers who sleep in their cabs then wake up and ask you if you want a ride 200 times a day. Go back to bed! 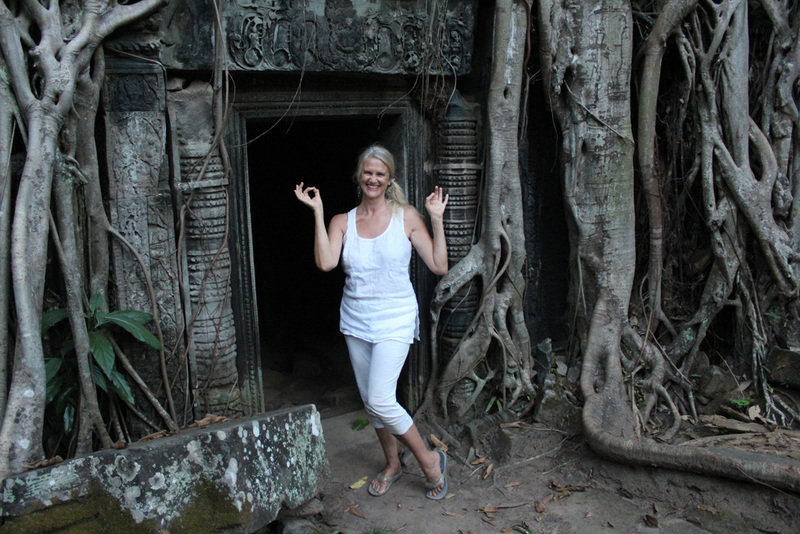 my favorite temple Ta Prohm. What fun! 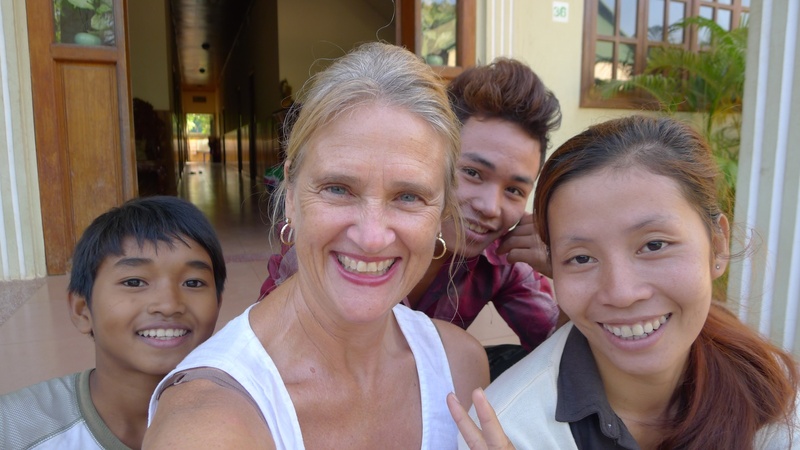 Cambodians are super friendly and want to learn English and try out their English on you. But be sure you speak so slowly so there are no misunderstandings in communication. Their smiles are genuine – I’m tripping out on the love I feel here. No matter what I do at my guesthouse the Cambodian family who owns the joint is treating me like royalty. I think I’m the only white honky there. They don’t know much English and I know far less Cambodian but we try to understand each other; the unspoken love is radiating out from them. Don’t miss this country – it gets under your skin and you don’t want to leave! I’m still here and it’s been 7 weeks. Thats when you know you are in the right place. When you can’t imagine leaving it. 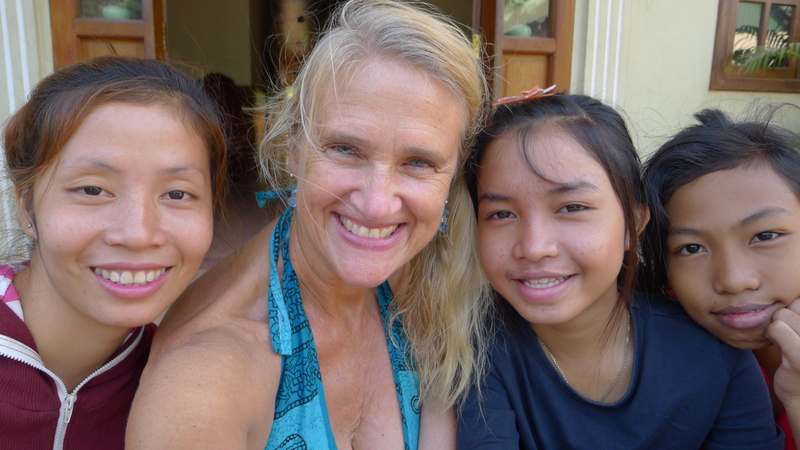 I met the Ingrams at my favorite restaurant in Pai, Thailand. I marveled at how happy the family was with two young sons eating lunch together, before I said anything. Then we started talking and I was astounded by their courage and heart-breaking story. You can’t miss this book, by Jarrett Ingram, whenever I find a book that I simply can’t stop reading I have to tell everyone and Following After Trek is it! Don’t miss it as this book will make you laugh and cry and give you wisdom on living life fully and totally from your heart. 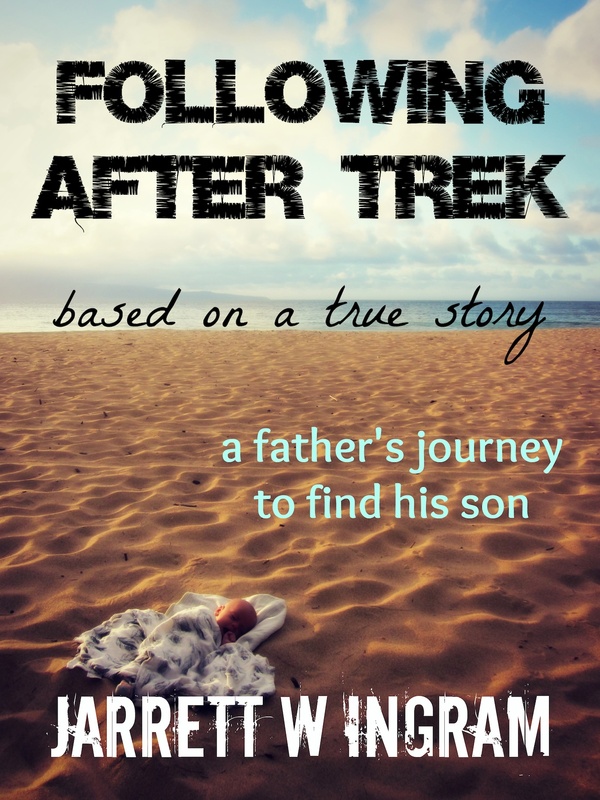 Jarrett’s experience of losing his son, Trek, their third child is told in vivid detail and I felt spiritually recharged and revitalized after reading his story based on the true life facts. I have never met anyone like the Ingram Family. Overcoming their hardship; they are shining their love out to the world and we are fortunate to bask in their wisdom and grace. Reading this book is like being with the Ingrams and experiencing their remarkable spirits. Get the book here on Amazon, hard copy and for Kindle, and on Jarrett’s site. 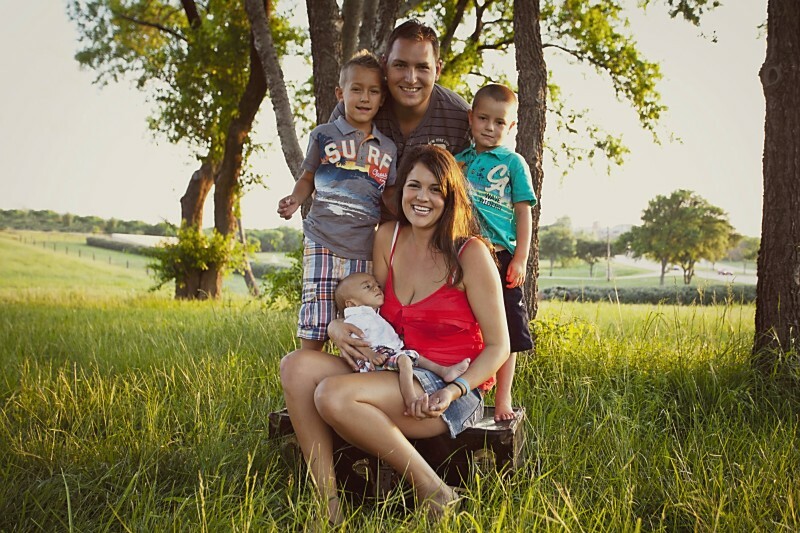 Read Chelsea’s blog Our Sonny Life on their epic journey. I am astonished by what Wolf Price is doing in Nepal – after visiting (7 times in 7 Years) and teaching in this tiny, poor, and gorgeous country squeezed between China and India he decided to help the girls of this country get free with education, scholarships and computers. He has used his own money to do this and recently forged an alliance with American Apparel of the USA. Wolf and AA designed a beautiful t-shirt and 100% of the profit from the sales goes to girls in Nepal who are eager for education and will not be being forced into servitude or marriage having babies at 13 years of age. See Wolf’s movie he made about the girls in Nepal here. I first comprehended mortality at five. Overwhelmed, I sat down on a rolled up rug and cried. At first I was sad my parents would die, then I imagined the disabled and disadvantaged people of the world- my sympathy for that group outweighed the pain of mortality for my parents and myself- As I sat there in extreme turmoil, I vowed to alleviate as much suffering as possible in my lifetime and stood up in triumph with new found energy to do something significant for humanity in my lifetime- That was 20 years ago. 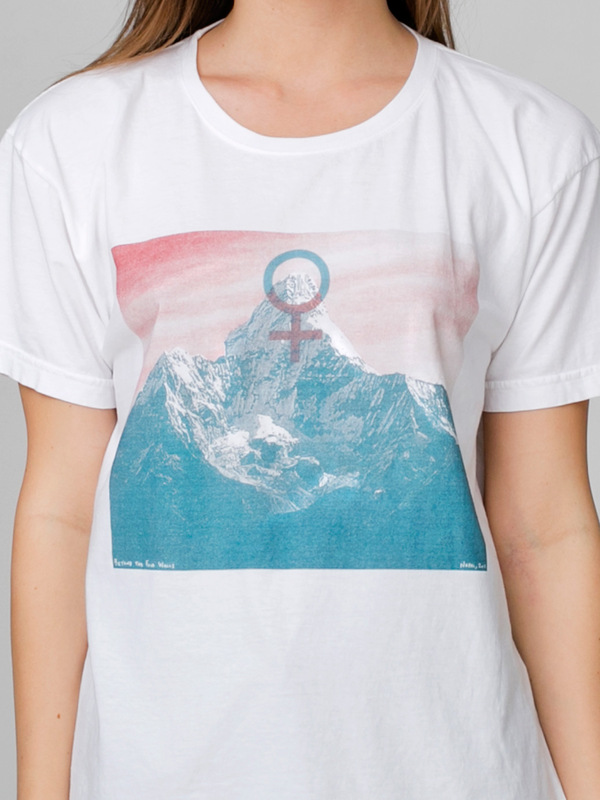 My end goal is to grant $20,000,000 (1 million t-shirts sales) to the most talented and at risk women in Nepal, to demonstrate the global force they can represent if educated. The next 3 months are unique and critical. I have to seek public support one last time for administrative and other development costs. Now is the time to have the highest possible impact from a charitable investment. B4W is designed to be sustainable, measure impact, operate on low overhead, and transfer management to top participants within 3 years. Please take a 10 minutes to help create a miracle this holiday season- at the end of 2012 or in the infancy of 2013.
for my 3 year global budget in 3-6 months. if we sell 1,500 Beyond the Four Walls shirts the 3 month start up budget will be covered. ($30k). Watch this message from Prathi 2010– 18 years old, who was married and pregnant with her second child less than 2 years after this message was recorded. This project is entirely dedicated to her and the millions of literate young women like her in developing world with no money for education being silenced from arranged marriage every year.Robert E. Levin, the award winning innovator and author of the best selling 1st biography of Bill Clinton, has become my executive advisor to accelerate talented and disadvantaged girls in Nepal. 57% of women in Nepal are married before the age of 18 (UNICEF). In rural Nepal, as many as 69.7% of girls marry before the age of 15. I’m asking for your help to help to strategically spread the word during the final days of 2012. 2013 is going to be a successful year but we are still in a stage where $500 (minimum tax deductible amount) will make a significant long term impact.If you want this cause to be successful, consider forwarding this message or compose your own version. Otherwise the easiest way to help is to buy the official shirt of the movement- 100% of proceeds will be used for educating girls in Nepal. 2012 was the year of Malala Yousafzai, and therefore the perfect year to contribute to empowering literate young women in developing countries and breathe life into her generations rapidly disappearing relevance once married. The world will be a better place if we help this historic generation of women- the first to be educated in their families. The time of the most marriages is January/February, I am determined to be in Nepal by January, to start sponsoring as much education as possible (with t-shirt funds) to rapidly strengthen my proof and infrastructure for major grants and high profile partnerships in 2013 and beyond. Thank you- attention and action from this message is monumental for the cause. 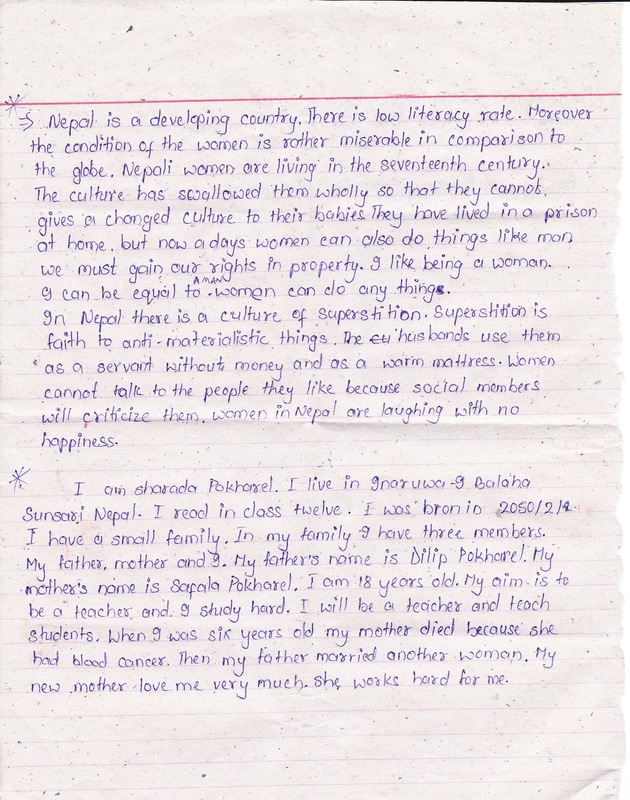 Attached is an image of the shirt and a letter from Sarada, the original B4W student, who I’ve personally sponsored fee’s for computer school since March 2012. Happy Holidays and conclusion to an amazing 2012. Cherokee Billie wrote this astonishing book after living each page of it and you will not be able to put it down once you start. It is riveting. I started this book at 9PM and could not stop reading until 2AM. I was inspired after reading it as I realized how we are seduced into bizarre influences by advertising and religion. Reading about how the author was in love with a cult member and joined the group was fascinating: her struggles, emotions, and evolution are all here and how she got the strength to let it all go and walk her own path. We all want to be loved. And I know you’ll be inspired to be the love you want after reading this book – if you read one book this month – discover Heavenly Seduction. You’ll be thrilled you did. CherokeeBillie.com check out her site, she has a powerful Youtube channel and information on psychic readings, connections and healings are here. I have been listening to her meditation and stress relief recording free every night on her Youtube channel and it always puts me to sleep. Sweet Dreams.